Join us for an evening of ethical fashion, bees, bio-dynamic champagne, local music, locally made nibbles and inspirational speakers, during Pollinator Week at Jindii Eco Spa, within the Australian National Botanic Gardens. 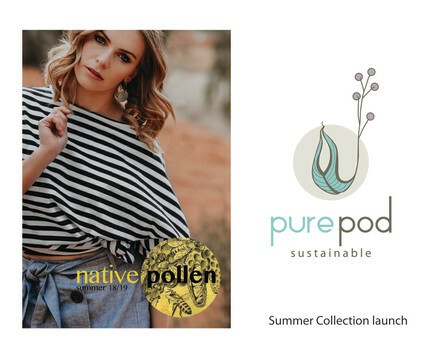 We are excited to officially launch the Pure Pod “Native Pollen” 18/19 collection as part of the evening’s activities. This collection focuses on bees during Pollinator Week, to discuss the importance of bees to our environment, along with the importance of ethically produced fashion. Pure Pod NATIVE POLLEN Collection will be available for purchase on the night. 15% off the NATIVE POLLEN collection will be available to ticket holders on launch night only. Abby French from Bursaria Workshop will also have her beautiful home décor pieces for sale. Pure Pod has worked with Abby on a limited edition Native Pollinator print for this collection. All guests are to park in the open-air car park, off Clunies Ross Street, as the Gardens’ parking will be closed. This parking is next to the Gardens’ main gate entrance and is free. Walking access to Jindii Eco Spa is through the small gate entrance, at the back of Jindii. Buses travel past this area to the ANU and various parts of the Uni area. Please check local time tables and buses.